Watsonville, CA - What involves a little dirt now translates into a lot of beauty this September. The scene is the Santa Cruz County Fairgrounds and the task is to put 13,000 flower plants into dozens of flowerbeds. The plan is to have as much fun as possible and everyone is invited to join the scores of community volunteers who come out each year to plant flowers. The reward will be a Fairgrounds filled with color as 80,000 friends and neighbors visit during the annual six day Fair in September. The Seventeenth Annual Santa Cruz County Fair Flower Planting Day is set for Wednesday, June 18 from 5 to 7 PM. All service clubs, individuals, and families are encouraged to attend this fun event. Those joining in will be planting colorful annuals knowing they will see the result of their work during the fair this September. The Heritage Foundation is hosting hot dogs and drinks and everyone will get a chance to spend some time visiting with old friends. Again this year's flower planting day has been scheduled for Wednesday, June 18 from 5 to 7 PM. at the fairgrounds. Those planning to lend a helping hand are asked to bring gloves and a trowel and to RSVP by calling the fair office at 724-5671. The Santa Cruz County Fair celebrates the rich history of our community and people and invests heavily in bringing this heritage to our youth. 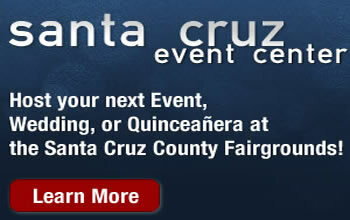 The 2008 Fair will be held September 9-14 at the Fairgrounds located on Highway 152 just east of Watsonville.